Last year, we talked about programmatic being the trendiest buzzword in recruiting. Today, we know that programmatic recruitment is a powerhouse technology. 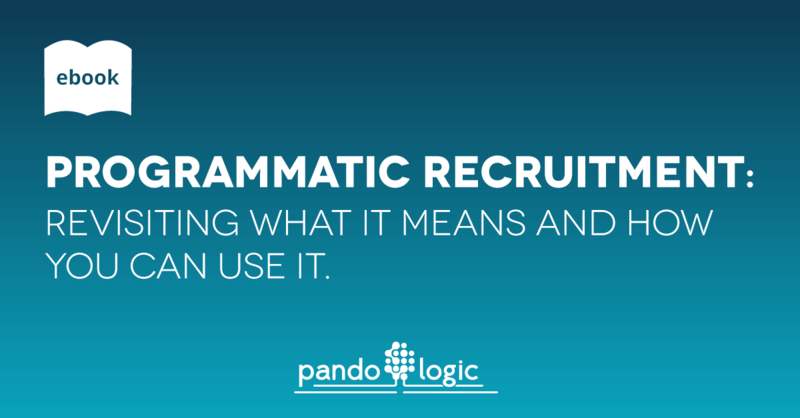 Download our latest eBook, "Programmatic Recruitment: Revisiting What It Means And How You Can Use It" to learn more about how this "buzzword" can create results. pandoIQ eliminates applicant sourcing inefficiencies and wasteful spending for top staffing agency. Last year, we talked about programmatic being the trendiest buzzword in recruiting. Today, we know that programmatic recruitment is a powerhouse technology. Over $10 billion is wasted on job ad placement each year due to inefficient spending. Smart and intelligent campaign algorithms are the answer. Download this eBook for the inside scoop on marketing industry best practices that will help you find, attract, engage, and nurture talent. Download this eBook to source applicants more efficiently, reduce your cost-per-hire and time-to-hire, and improve your quality of applicants. Download The State of Recruitment Marketing 2018 for a deep dive into the data and explore how you can use recruitment marketing to attract top talent and build your employer brand to achieve business success. Get access to this webinar to discover how AI-enabled automation can impact your company's recruitment advertising strategy. Programmatic recruitment is one of the industry’s most talked about buzzwords and according to experts, it’s the future of talent acquisition. Download this eBook and learn how the power of programmatic recruitment can help you source quality candidates better, faster, and for less. 43% of companies say sourcing entry-level talent is one of their biggest challenges. Get access to this ebook to beat out the competition and win over today and tomorrow’s top entry-level talent. Discover best practices and creative ways to attract and retain the most qualified candidates. What does it mean to be a recruiting leader and what does it take to get to the top? Download this eBook to learn how you can hone your craft and develop skills that make you invaluable in the eyes of candidates and employers. A good job advertisement emphasizes why an individual should apply for the job. But how do you write an ad that entices relevant job seekers to take action? Download this eBook and learn how you can write a top performing ad and attract the perfect candidates today.